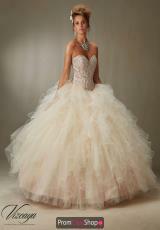 Vizcaya 89068 is a magnificent ball gown with a beaded bodice and tulle skirt. The beaded coverlet is removable and the sweetheart neckline is perfect for any figure. 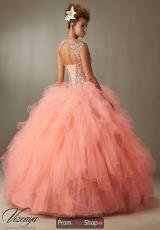 The tulle skirt features voluminous ruffles that make this dress perfect for prom, cotillion and quince. The back is straight across and features a corset lace up that ensures a perfect fit. This dress comes with a matching stole.